Facebook unveiled Safety Check, a new feature to keep loved ones apprised of each other during a natural disaster such as a tsunami, earthquake or hurricane. The app is simple. 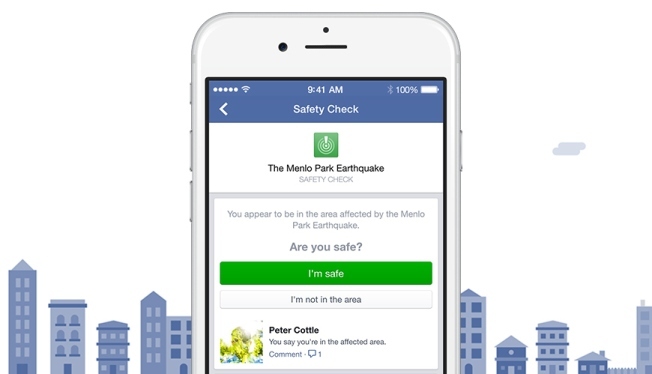 It uses push notifications on devices hear affected disaster areas and if a Facebook user is fine, then he or she pokes the "I'm safe" button. It then notifies the News Feed, so all Facebook friends can see, according to the Verge. However, the app only works if you have used the Nearby Friends feature and it already had GPS coordinates on you. If not, it won't work. The app came out of the Japanese tsunami in 2011, and Facebook's disaster message aboard later became Safety Check. VideoApple Announces "The World's Thinnest Tablet"